We recognise the purchase of the diamond is an important emotional occasion, and believe in making it special for you. In order to help you make the correct choice we freely offer our experience and expertise so you fully understand all the individual factors which combine to affect both the appearance and cost. As Diamond specialists we are very selective about the elements of quality that visually matter and cherry-pick for our customers, only those stones that have the “wow” factor and also represent excellent value. In addition rest assured that our stones are ethically sourced. There are numerous companies on the internet selling stones based on price and a certificate alone, of which there are many different types; a subject in itself - taking a leap of faith and buying from faceless sources can be a risky and costly strategy. 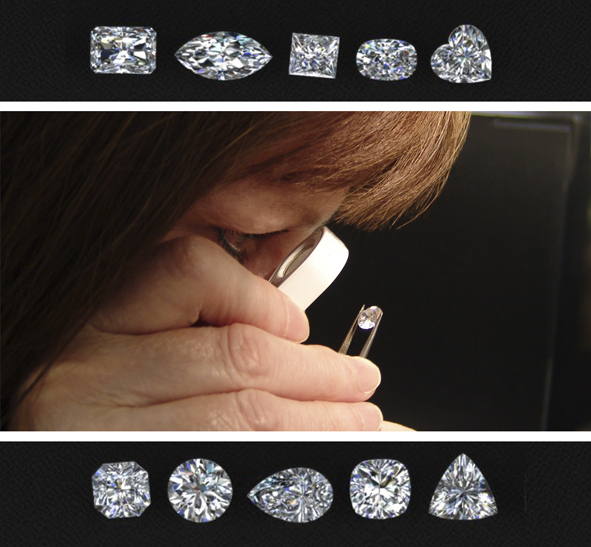 Even Diamond Certificates that are produced by a number of laboratories differ in degrees of accuracy - hence we feel it is absolutely essential to view a stone in person under expert guidance, and have explained the cut, colour, clarity and other factors that combine to provide that wonderful sparkle we all seek in a cut diamond. This is a question we are asked every day and as the three options available are all visually quite similar – it can be confusing until we explain the merits and properties of each precious metal, and also the different costs involved. Platinum is the ideal choice as this beautiful metal is the whitest and strongest. It is also the rarest and heaviest – and if you have the budget it is excellent for engagement rings, wedding rings, eternity rings and diamond settings. Traditionally in recent times, the alternative to Platinum has been white gold. Many people think it’s mined this colour, but it is in fact an alloy created by mixing gold (which is yellow) with white metals such as Palladium and Silver. Correctly proportioned these turn the yellow gold quite a white colour, but the completed item still needs to be Rhodium Plated (a very white, thin but hard, precious metal coating) to give the white look of Platinum. Depending on what alloy of white gold a manufacturer might use, the underlying colour beneath the Rhodium plate can vary greatly and we can explain the way to avoid issues with this to you. We will also show you Palladium which is a very white precious metal; part of the platinum family. This increasingly popular option has had hallmark status since January 2010 and is a very viable and more economical alternative to 18 carat white gold, as well as being whiter. So to help you choose, call in and we will share our depth of knowledge and expertise to help you make the right choice.